Led by the irrepressible and fantastically charismatic Johnny Kalsi, Dhol Drummer with The Afro Celts, this show features a vast array of musical styles, Drum and Bass, Tabla, Hip Hop and Bhangra… all delivered with great theatre and with more than a bit of Celtic influence doubtless gained from Johnny’s work with the Afro Celts. They had some widely spoken about, storming festival performances last year and will be back for more in 2011. The Dhol Foundation is now both a dhol drum institute in London and an incredible group playing Bhangra music. The Dhol is a traditional North Indian instrument made from a large wooden shell played with cane on one side and a hard curved stick on the other. Vibrant and loud, the infectious beats rush through the sound of electronica elements together with folk traditions of song and dance of the Punjab. The Dhol Foundation make up the amazing & mighty sound with choreographed moves and a high energetic performance not to be missed. The band have had their music in Hollywood films such as ‘Gangs of New York’ and ‘Incredible Hulk’ and also have done work on soundtracks with Peter Gabriel on films such as ‘Rabbit Proof Fence’ and ‘The Last Temptation of Christ’. They opened the Commonwealth Games in Melbourne in 2006 performing with a spectacular array of international performers. They opened the Live Earth concert alongside other drummers from around the globe on June 7th 2007 and have performed numerous times at the WOMAD festival, so have a wealth of experience all over the world. 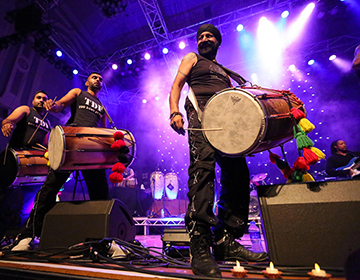 Established in 1989 Johnny Kalsi heads the group, travelling around the world to promote the Dhol to the masses. 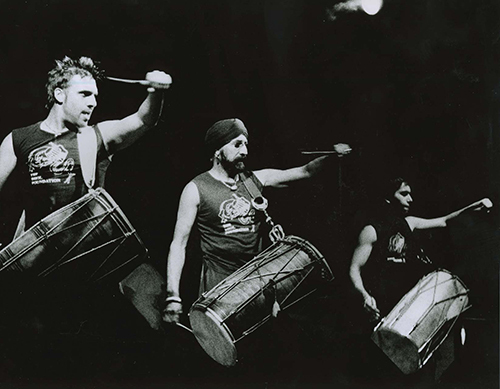 Often headlining at major events and festivals such as WOMAD, Johnny has also played with a whole range of music groups, from the golden age of Bhangra, Alaap, to more collective groups such as Trans-Global Underground, Imagined Village and the Afro Celts. 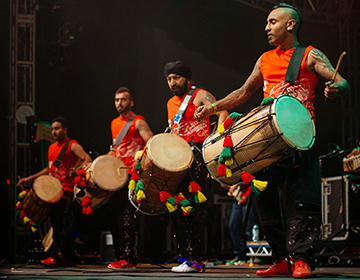 The Dhol Foundation set out to really explore the capabilities and diverse range of music from various cultures around the world. 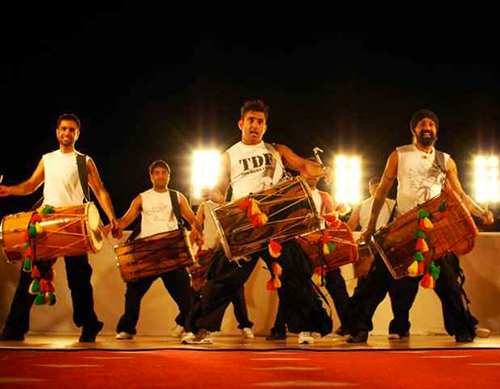 This openness to other cultures sets the group apart from other dhol groups. This is, the unique sound of the Dhol Foundation and, the reason why the dhol has been exposed to cultures and countries where it has never been heard before…..TDF style! Rock, pop and electronic, drum and bass, classical elements it's all in there. Through Johnny Kalsi's vast experience and knowledge of dhol and a whole array of percussion instruments he set out to create The Dhol Foundation to share and spread his love for the art. Before the creation of The Dhol Foundation there was no set methods of learning dhol, usually each master would have devised his/her own style and pass I on with no real written notes. The Dhol Syllabus was created by Johnny to simplify understanding of the dhol rhythm and to attain high standard of dhol practice. Johnny Kalsi's intensive knowledge of music production and the processes involved has earned him great respect within the music and entertainment industry as well as educational institutes. This combination of skill and experience on the dhol and in the studio put him in a strong position to create the GCSE in dhol so that students can learn without any compromises and benefit from his wealth of knowledge. This well established syllabus has been recognised by GCSE awarding bodies and as a result the dhol drum can be chosen as an instrument of choice. The full backing and support of TDF is given to those students who wish to study the instrument at GCSE level music. Engaging, energetic, is just how they do it. 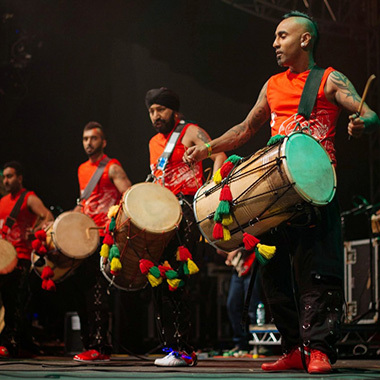 The Dhol Foundation has featured and headlined at most major music events around the world wowing the crowds with their dynamic, thunderous beats. The musical influences are formed from a rich tapestry of culture and music from around the world, absorbing their culture, moving it to another part of the world; add their bit twist, and finally a bit of the TDF magic before powering it out through the muscle of the Dhol Foundation. In 1991 Johnny Kalsi released his debut album in 2001 ‘ Big Drum Small World' . The album was recorded all around the world and his influences were drawn from the bands he had played with. Big Drum Small World was a storm for the global music scene. Johnny gained an immense amount of experience in the studios and his vision and pallet gave him the ability to create and write great music. In 2004 he released ‘ Drum-believable ' an eclectic mix of music from around the world, and in 2007, was the third instalment from the power house, The Dhol Foundation titled ‘ Drums & Roses '. You can see the correlation in the names of the albums. We'll leave it to you to guess the name of the Fourth album due for release mid 2010…..